The tabloids are onto us.. Thanks so much for your lovely comments about my exciting news. I am starting to feel sooo much better in the past few days.. still a little tired, but no longer bed-ridden and nauseous. Now, I just have to start thinking about Christmas and Sophie's 3rd birthday which is 2 days after Christmas.. Ek!! 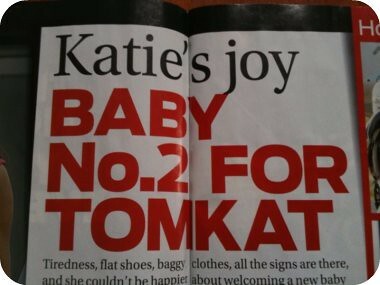 P.s Yes, can you imagine how much grief I get about being a Katie married to a Tom.. seriously people, it's not that hilarious.. Although, I do love collecting all the headlines. My favourite is on our fridge.. The headlines should keep you in anniversary cards for a long time. Glad you are starting to feel better - being a pregnant vomitron is the pits. Hope Sophie has an ace birthday! We have a third birthday in two days... bike with trainer wheels also on the request list here.